Capt. David T. Wooley, was a 31 year veteran of the FDNY. He loved his job, and looked forward to facing a challenge each and every time he went to work. 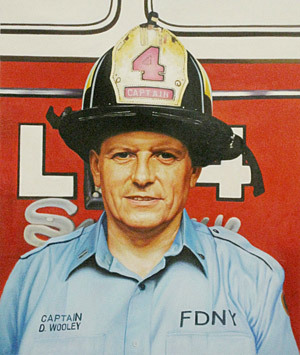 He thrived on it, and was proud to be a Captain at the second busiest firehouse in New York City. He referred to his company, Ladder 4, Engine 54 as his second family, his home away from home. He and his fellow firefighters had a very special bond. They looked up to him for guidance and leadership. He loved them like they were his own family. When he wasn't fighting his way through rush hour traffic towards a fire in Midtown Manhattan, he ran a wallpapering/painting business in Rockland and Westchester Counties in upstate New York called, "The Perfect Match." This business increasingly grew over the years, mostly by referrals from his clients. Aside from his impressive work, he was well known for his smile, warm demeanor and charismatic personality. Capt. Wooley was a devoted family man. He and his wife, Linda, were married for 33 years. They first met at a pool hall on Staten Island, NY. They fell in love and were married shortly after. They had a special love for one another that was always present. It was present in their eyes and in their smiles, and in the way they spoke to each other. They had many things in common. For instance, their great love and devotion to their family, their tireless work ethic, their love of Broadway shows, fine dining and travel. It was a match made in heaven. My brother, Dave and I, also had a very special relationship with my Dad. When we were kids, my Dad would juggle back and forth between managing my brother's travel Hockey team, and driving me to dance lessons an hour away. Together, he would take us to baseball games and hockey games. When we grew older, Dave and I would meet him in the city for various events including the Auto Show, concerts, dinner at our favorite restaurant, or to watch the fireworks on the fourth of July. The three of us were always doing something together. On March 21st, 1998, Capt. Wooley's pride and joy was born, his grandson Justin. He loved being a grandparent. It was like being a father, but much more fun. He and Justin would go to the park together, play video games, read stories, take naps together, go to baseball games. He adored Justin, and the feeling was definitely mutual. Although Justin is only four years old, he is filled with so many wonderful memories. Capt. David Wooley was such a remarkable man in every aspect of his life. On the tragic day of September 11th, he sacrificed his life to save others because that's who he was; a selfless, strong, caring, understanding, warm and extremely brave man. Capt. Wooley is remembered as a hero, not only for the man he proved to be on September 11th, but mostly for the man he was everyday of his life. Tribute submitted by Stacy Wooley.